Tony's ART Works from Shining World is easily one of the best art books I've ever purchased, and with its impending release in the US, even more people have the chance to enjoy this fantastic art book. I'm reviewing the Japanese edition, which may not be the same presentation-wise, but should have the same content. Presentation is one of the many aspects where this book really shines. It comes in a slip case that partly conceals the beautiful cover art work that was newly illustrated for this art book. The printed cover uses a glittering design to further conceal the girls until you open the book, and the first illustration is a full reveal of the cover art. 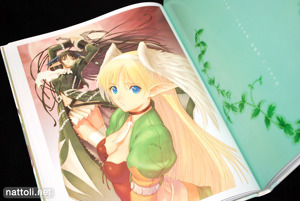 The index for the art book is placed at the beginning of the book, noting game series and publication information next to a photo of the illustrator himself. Tony's ART Works from Shining World is an over-sized B4 art book, hardcover, and 208 pages. It starts off with a section titled Beauty of Nobleness which goes from pages 8 through 29 and includes DVD illustrations from the Shining Tears X Wind series. Art works from the Shining Wind drama CDs are also showcased in this section. 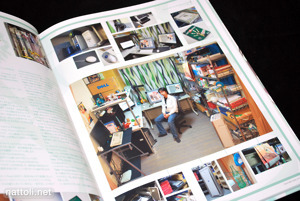 At the time of publication, this first section of the book represented the newest art works for the Shining World franchise. 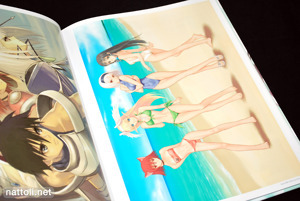 There are a few breaks from the art works scattered through out Tony's ART Works from Shining World that feature discussions with Tony Taka on different subjects. The first one is a three-page illustration process, complete with sketching and line art of how Tony Taka illustrated and digitally colored the cover art work. The next section is titled Tears Trickle Down and features 52-pages of Shining Tears illustrations. All of the illustrations in Tony's ART Works from Shining World receive a full-page, with only a single two-page spread illustration at the very beginning of the art book. Even the horizontally aligned images are fit to page, really giving them the best display possible. At the end of the Shining Tears section is another talk with Tony Taka, this time showing off his impressive workspace. One of the advantages of this art book having a US release is finally being able to read those interviews, as they look to be quite interesting. The art of Shining Wind is next, in a section titled Wind Blowing the Mind. The illustrations in this section run from pages 84 through 125 and offer a really comprehensive collection of Shining Wind art work. And as any good video game art book should, it ends with about 80 pages of character art that includes different poses and costumes for all the characters from Shining Wind and Shining Tears. It would be great if there were more game art collections like this one. I have nothing but praise for Tony's ART Works from Shining World, and though I don't know whether or not the US edition will live up to the masterpiece that is the Japanese edition, the content alone should be worth cover price for most folks ^^ And you can always import! As a fan of Tony Taka's terrific art, very glad I bought this amazing book. Already had the "Shining Wind Collection of Visual Materials” & “Shining Tears Collection of Visual Materials” books whose content is included in this “Tony’s ARTworks from Shining World”. (In fact sold those two books after getting this more comprehensive, superb hardcover.) A great book chock full of stunning artworks. I have this, it's one of my most treasured possessions. Great review, it does it justice! Iam still very sad that I missed to buy the book when it was fresh... Now the price tag gone pretty damn high wtf. Import from Amazon JP? I didn't think they shipped outside of Japan. If you can buy the japanese version, the usa's comes with crappy quality paper. I'm truly glad I've come across your website since I've been thinking of getting this artbook published by UDON just for the english interview with Tony Taka XD. Music CD? I think you just mentally switched over to the Atelier Series Chronicle XD For anyone else reading, there's no music CD with Tony's ART Works from Shining World. Hey nat do you know if the US version has also the nice slip case like the japanese hardcover version? Iam still considering trying to buy the hardcover tho... (from hlj.com and yeah i know its risky that even tho they still have it as out of stock and ofc it is with hlj.com very possible I will never hold it in my hands :D) But to be finally able to read those interviews included in artbooks is also worth to think about purchasing the US version. Bcoz I could easily get it also from the UK version of eBay and for much less shipping cost (and ofc in less then 7 days of shipment). Looking for youre advice nat!!! Nvm screw that hardcover i guess. I even found it on thebookdepository... 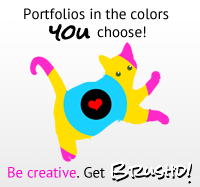 Which is a well known site that ships worldwide for free! BTW nat I wonder what more artbooks got released as english versions... I know about Ugetsu Hakua (Also bought it 1 year ago :D) and now about Tony Taka + Vagabond and Akira club, but were they more you know about? I recently got the English version of this book and it is quite gorgeous. Even the feathers on the front cover are soft and fuzzy! It's not in hardcover, nor does it have the slipcover, but everything else about it was really well done and it seems to have stayed faithful to the original Japanese release. It also is pretty cool to have the Tony interview in English!